Loadouts: What ever i feel like on the day. Sites: Trojan airsoft, stockport. Sou kula airsoft, oldham. Am getting into airsoft after going to a game with a friend from work. I was immediatly hooked and so started reading up on airsoft. After learning that most guns share very similar designs and most can be upgraded internally i have bought myself a King Arms Blackwater M4 pistol. 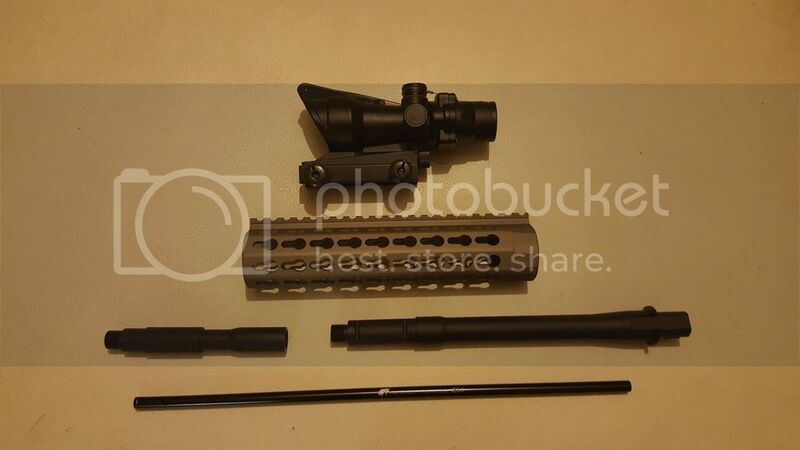 I wasn't able to find the cqb or carbine version in stock anywhere in the uk so i bought a 2 piece carbine length outer barrel, a 36.3cm 6.03 madbull tightbore barrel, a 7 1/2" keymod Ris rail system and an acog scope. I'm going to buy a stock for it next payday along with some other bits. I come from a 15 year RC background so tinkering with the gun isn't going to be a problem and more than likely i will find building and modifying guns more enjoyable than using them as i do RC. I'm looking forward to going to some outdoor events and think I could really get into milsim type events after watching many many youtube videos. I also look forward to getting killed by any of you that I meet but be warned, I will return fire lol. Am getting ukara after next game. Will end up with a whole heap of guns and will build custom gun rack to house them. Said goodbye to bank balance 15 years ago lol, rc is also an expensive hobby, currently have 4 projects on the go and now 1st airsoft project which i cannot wait to get stuck into. Where abouts are you located and what sites do you go to ? Am located in manchester and have only been to the hive once but there are plenty of sites within an hours drive that i can get to. I believe there are also some paintballing sites that have airsoft days so that further opens up locations to shoot at. I am looking to go all over the uk though. Where do you play and have you got a favourite field or other venue to shoot? I have only been to one site consistently at the moment and that is Epsom Tunnels an old WW2 air raid shelter its dark, Full auto and very full on which I really enjoy it gets the heart and pulse going. I am looking at getting out like yourself, the mall at reading, sand pit at kent and a place in portsmouth have all caught the eye so hopefully ill be trying new places as well. So i got my first set of parts through. Acog scope, 7 1/2" Keymod Ris Rail, Madbull Black Python v2 363mm 6.03 tightbore barrel and 2 piece outer barrel. This is so I can urn my M4 pistol into a carbine/cqb size gun. 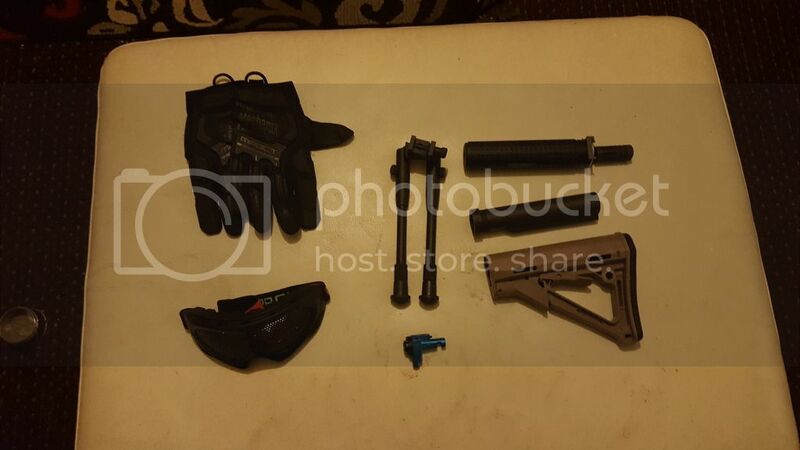 Next to buy are stock, torch, foregrip and some spare mags. Have you been to Trojan stockport? So I got more parts through delivered by different shops and have to say I am very impressed with patrolbase's service, with their text and email alerts. Had a few from them now and would reccomend to anyone based on my buys so far. Anyway on to the parts. Nuprol mesh goggles and Mechanix M-pact gloves. I will do a build thread once the gun to gets here but the drivers for ukmail haven't found my address and despite me leaving a contact number for them, they haven't called but returned to depot twice.